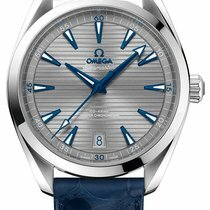 New/unworn Omega Seamaster Planet Ocean 600M Co-Axial 232.30.42.21.01.001. 42mm Stainless steel case. Black dial with silver-tone hands and luminous index hour markers. White Arabic numerals mark the 6, 9 and 12 o'clock positions. Minute markers around the outer rim. Luminescent hands and markers. Date display at the 3 o'clock position. Black ceramic unidirectional rotating divers’ bezel. Omega Automatic co-axial Calibre 8500 movement. Anti-reflective domed scratch resistant sapphire crystal. Screw down crown. Exhibition case back. Helium escape valve. Stainless steel bracelet with a deployment clasp. Water resistant at 600 meters / 2000 feet. E.U Box Full Omega warranty Papers dated March 2019. As the watch is unworn the picture you see is a library picture! We sell only what we have IN STOCK! All watches presented can be viewed and picked up in our office in Wilmslow, Cheshire at your convenience or sent by insured courier. Please note that office visits are by appointment only and because our watches are securely stored away from our offices in a bank vault, we usually require 24hours notice for a viewing. If you are not delighted with your purchase then we are happy to refund your full purchase price within 14 days of receipt, just return the watch to us as you received it and we will refund by the same payment method.